First of all, the final exam season is finally over for me. Yes, THE END for this winter term. Moreover, summer classes don't start in two weeks. What does that leave me.....? A room, very spacious one, to do things that I have been postponing since reading week started! That includes cooking more delicious food, hunting for fabrics, reading books I ordered from Chapters and the list could go on and on. Most importantly, that leaves a lot of time to prepare for this exciting, first ever, Canadian Blogging by Post! Hosted by Sam at SweetPleasures. I am always keen on exchanging packages and writing mails through the traditional air mail. In fact, while back home I used to have some penpals from several different countries. The thought of sending and receiving packages from people around Canada is very amusing! To me, Canada has a vast piece of land and I am only occupying a very small piece of it. The rest of Canada seems rather mystified to my thought. For as long as I have been here, which is only less than 4 years, I have never been outside of Ontario. I have not even explored the whole Ontario. I wish someday I could go to the more remote area of Ontario and enjoy the view and tranquility over there. Kue Pukis. Now, this needs some explaining, agreed? As you can see, the name of the recipe is not in English because I don't know how to properly translate it. All I can say to you is that this scrumptious snack is a traditional food in my hometown, Surabaya. This snack has always been a part of my childhood. The more traditional they are, the better. What I mean by that is, this is not the kind of snack you will find in a bakery inside a modern shopping centre. They are mostly sold in a more traditional-looking places (read: markets). Either they are sold in a movable carts or in small vendors in the market. If you ever get a chance to see how this snack is made, you would probably think that there is no way of making them at home. Especially when it requires special equipment like the one you'll see in the recipe. Lo and behold, these savoury finger foods can indeed be created in your own kitchen. With a mini-muffin pan, you're set to go! The end result resembles mini cupcakes a lot. But don't be mistaken, they are not your regular quick breads! In fact, this is in between yeasted bread and quick bread since it requires instant yeast and a short period of waiting time. And finally, this snack includes chocolate, which goes along with Sam's theme! Shall we go on to the recipe? 03. Pour in the coconut milk, stir the mixture so that everything is well-combined. You will find the mixture to be like a pancake batter. Let it stand in room temperature for 30 minutes. So, meanwhile preheat your oven to 350 degrees F.
05. Have a non-stick mini-muffin pan ready. At this point, you may or may not choose to preheat your muffin pan (since the recipe preheated its special mold), because I found there is no difference. 06. 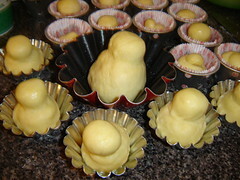 After 30 minutes, pour the pukis batter into muffin pans until about 4/5 full. 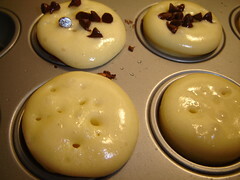 Then, remove from the oven and sprinkle some miniature chocolate chips on top. Continue to bake for 10 minutes, or until fully cooked. 08. Let the pukis cool down. 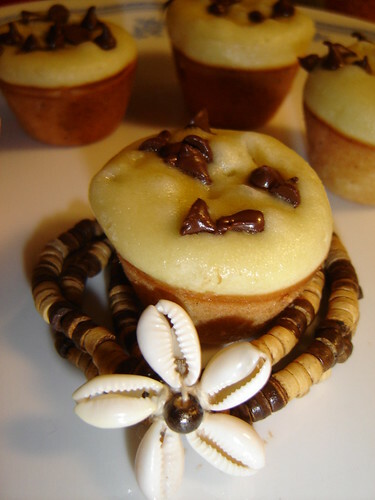 Carefully remove the pukis from the muffin wells with the help of a pair of chopsticks. 09. Serve with a cup of hot tea. Enjoy! SourCream Timbits Undergoes a Makeover! As you can all see, I have made some changes to my site and I must say it's not yet perfect. There are still some things to fix. Having no talent in design or even the slightest bit of good taste, the process has been taking place for almost the whole 24 hours. Thus, I have no idea if what I've made is pretty enough since I've been staring at the monitor for too long. I know, I am not supposed to do any makeover of my blog until exams are over. 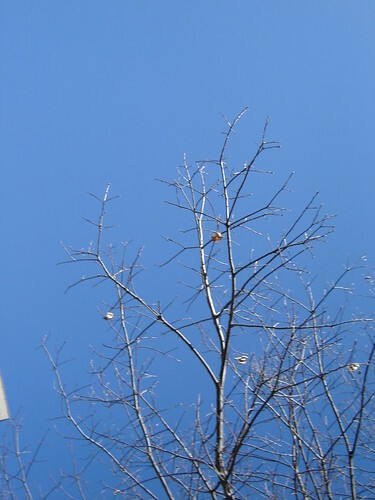 Too bad I've fallen too deep in obsession over making my blog a brighter place for the spring. Also due to exams, I will regretfully have to put a pause on my blogging activities. Do not worry, I have so many cooking, baking, and eating experience that I want to share with all of you! I'd like to credit for Sydney at The Sheriff for the caterpilar buttons I'm using on my sidebar. I don't know how to link back to your page using CSS, please tell me how if you can. What comes into my mind everytime I hear, see, or eat a brioche? Guess.. The memories of my late maternal grandmother :) I remember vividly how she liked this buttery, rich and silky smooth bread. Everytime we went together the largest shopping mall and condominium complex in Jakarta, called Mall Taman Anggrek (read: Orchid Garden Mall), she would request to pay a visit to this French café , Gloria Jeans. Brioches sold in this place are a little different from the common brioches, they are filled with different sorts of fillings. From savoury ham and cheese to sweet chocolate. As far as I can remember, these brioche à tête are rather hollow on the centre, making it a suitable well for the filling. This story dated more than a couple years back and I have never eaten or even seen brioche since then. Not until I came across a brioche recipe in Peter Reinhart's "The Bread Baker's Apprentice". Seeing the pictures brings my memories way way back. Even though it has been a while since she passed away and brioche was not her only favorite food, memories that flashed after seeing an image of brioche flowed unstopably. She was a warm and full of laughter. She wouldn't complain at all if we run around in the house or tease her all the time. She also made the best foods in the world! Her beefsteak and creamy mushroom soup are the two dishes I will never forget. For a more thorough information on Brioche, I recommend you to drop by Bea's Kitchen Blog at La Tartine Gourmande. I enjoyed reading her venture on making and enjoying brioche. A little bit about the brioche that made. At the beginning I wanted all to be brioche à tête, which is the French for brioche with head. There were two methods in Peter's book and I tried both of them. Unfortunately, I didn't quite get the end result with distinctive head that I wanted. None of the methods suggested that I put a smaller separate dough on top of the bigger dough. Instead, the first method was to divide the rounded dough with the side of my palm until they're almost cut into two. The second one suggested that the dough be rolled with bigger end on one side. Make a hole on the bigger side, then slip trough the rest of the long dough. The second meothed worked better though. Next time I should put a separate head and fill the dough with cheese or chocolate. 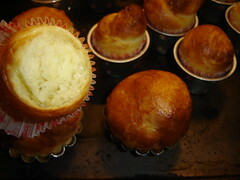 Overall, I'm really satisfied with my first brioche :) My hands are blobbered in butter while eating it. As you can see in the picture, the crumb is soft and resembling cotton candy. On some brioches, I noticed the crumb with long strands that reminds me of Pandoro. Due to the long laborious typing of the recipe, I am not going to post it. However, if anyone is interested to try this recipe, please e-mail me at ccayadi/at/rogers/dot/com :) I will try my best to crop the recipe without decreasing its quality. As a foreign student in a foreign country, it struck me as natural when I crave traditional dishes originated in my hometown, Surabaya. As the second biggest city in Indonesia, Surabaya is the center of most activities in East Java. Including the so-called traditional street foods. It is very usual to see food carts carried around your neighbourhood back home. You can get a variety of foods from appetizing rujak (Indonesian type of salad with thick peanut or shrimp paste sauce) to pipping hot meatball soup. One of my favourite street dishes is called "tahu telor". It can be literally translated into English as "omelette with tofu", but this translation does not suffice. You've got to TRY it yourself! 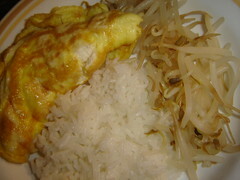 This tahu telor dish is nicely accompanied with savoury peanut sauce and a side dish of boiled bean sprouts. You'll find out how easy to prepare it in a minute! This particular tahu telor has a very tasty peanut sauce that I can't quite immitate. 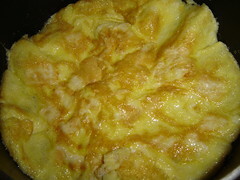 The fluffy omelette is made fresh on order. The way she prepares it, has something special too. All the more after I heard from my dad that the tahu telor seller was normally the husband of the woman. After the death of her husband, she continues his legacy and makes it even more famous. This meagre activity is also her family's source of income. The sincerity and passion of the cook surely reflects on the food s/he prepares. Thanks to my very knowledgable dad, I had the chance, not once but twice, to try this superb tahu telor! You will be surprised how simple this can be prepared at your very kitchen. In order for you to try, I have included a recipe adapted from Dapur Mbakyu (literally translated as "The Lady's Kitchen") that has been tried and proven to be a favourite (especially by Mr. W). The original recipe suggested petis udang (dried shrimp paste), but not being a fan of petis, I omitted it. Besides, I don't have it handy in the kitchen. 01. Saute garlic and cloves in a little oil until they are soft, not browned. 02. Combine all of the ingredients except the water into a food processor or blender. Add a little bit of water, around 1 cup. Puree until smooth. You would want to adjust the consistency by adding water until you get a slightly thin but not watery sauce. Kind of like the consistency of a caesar salad dressing. As you add water, you would want to maintain the taste by adding sweet soya sauce and a bit of salt. 01. Heat the oil, then pour the egg and tofu mixture. The Recipe Collection Meme - My 2nd tag! It's never too late to do someone a fovour including completing this tag, right? Unlike other bloggers who are already swimming in the sea of recipe books, I don't own that many cookbooks. Nonetheless, having been in Canada for two and half years, I have started to expand my collection of cookbooks. The first ones being some mini Periplus cookbooks from back home and a lovely book on Pizza and Pasta from my cousin in Seattle. I also obtain recipes from other source, i.e. the internet. In fact, during my first year in Canada I was a regular visitor of Leite's Culinaria. I tried some of the recipes from his vast collection, some his own creation and many from best-selling cookbooks. Some of them being, Pasteis de Nata, Portugese Fish Chowder, and Middle Eastern Meatballs. I guess I owe him a lot although I have never personally contacted him. Depend on my mood. I normally go grocery shopping once a week, so sometimes I decide on a theme for the week. For example, there was Mediterannean food week where I cook recipes coming from my Meze cookbook. Later on I bought a Japanese cookbook that was on sale, which motivated me to seek the most authentic ingredients possible. And cooking up the recipes from that book for the whole week. So, looking from my habit, I guess I try on new recipe quite frequently. However, I also love to revisit some old recipes. Where do you store your favourite recipes? All of my cookbooks are either organized neatly on the bookshelf or lying around on the carpet. Other than that, I wrote down (by hand!) 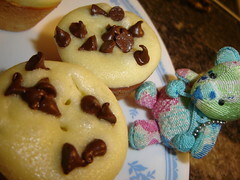 some recipes I found online and have tried in my hard-covered Happy Teddy notebook. How large is your recipe pile? Is it organized? If so, how? It's not that large. Just some cookbooks and a notebook. That's all I guess. I don't own that many recipes that I need to pile them. By the way, I also have another notebook where I keep the recipes from my grandma somewhere in the bookshelf. Oh, I guess I'm not that organized at all. On the other hand, my mom clips recipes from newspapers and buys monthly cooking magazine. I remember she piles them up in a small cabinet under the microwave. This is a hard question! How am I supposed to know how old the recipes are. Perhaps I should go back to the time when my interest of food just started to bloom. Ugh, I can't really rememeber! 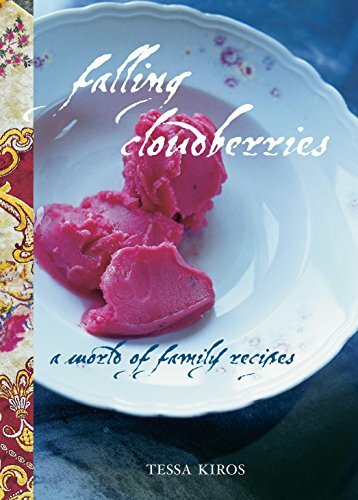 In terms of the age of the recipe itself, I remember asking my mom for a fruit salad recipe with hollandaise sauce my grandma (form my mom's side) used to make. This is the oldest recipe I can think of and I will need some time before I can find this piece of paper. Are you really ever going to make all those recipes in your to-try pile? To be honest, NO I'm not going ot be able to try all of them. As a beginner, I followed the recipe exactly both for cooking and baking. Sooner or later, influenced by Food Network's chefs, I began modifying the recipes as I cook to best match my taste. As for baking, I tend to follow the exact recipe in order to avoid failing. Sometimes when I'm feeling creative I would add some extra ingredients here and there. I am most unfamiliar with French cuisines. So, I would say that cassoulet and confit are the recipes I'm still hesitating to try. Tag at least one new food blogger for this meme (“new” as in only blogging a few months). Tag at least one food blogger you visit regularly but never interacted with. Tag at least one food blogger you constantly visit and leave comments. Tag anyone else you want.